WASHINGTON, March 28 (Reuters) - U.S. President Donald Trump signed an executive order on Tuesday to undo a slew of Obama-era climate change regulations that his administration says is hobbling oil drillers and coal miners, a move environmental groups have vowed to take to court. The decree's main target is former President Barack Obama's Clean Power Plan that required states to slash carbon emissions from power plants - a critical element in helping the United States meet its commitments to a global climate change accord reached by nearly 200 countries in Paris in 2015. 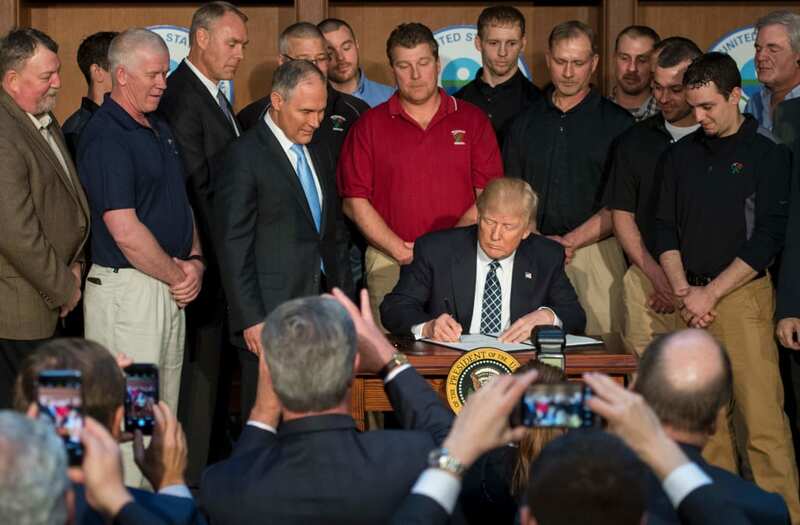 "I am taking historic steps to lift restrictions on American energy, to reverse government intrusion, and to cancel job-killing regulations," Trump said at the Environmental Protection Agency headquarters, speaking on a stage lined with coal miners. The wide-ranging order is the boldest yet in Trump's broader push to cut environmental regulation to revive the drilling and mining industries, a promise he made repeatedly during the presidential campaign. But energy analysts and executives have questioned whether the moves will have a big effect on their industries, and environmentalists have called them reckless. "I cannot tell you how many jobs the executive order is going to create but I can tell you that it provides confidence in this administration's commitment to the coal industry," Kentucky Coal Association president Tyler White told Reuters. Trump signed the order with EPA Administrator Scott Pruitt, Interior Secretary Ryan Zinke, Energy Secretary Rick Perry and Vice President Mike Pence by his side. U.S. presidents have aimed to reduce U.S. dependence on foreign oil since the Arab oil embargo of the 1970s, which triggered soaring prices. But the United States still imports about 7.9 million barrels of crude oil a day, almost enough meet total oil demand in Japan and India combined. While Trump's administration has said reducing environmental regulation will create jobs, some green groups have countered that rules supporting clean energy have done the same. The number of jobs in the U.S. wind power industry rose 32 percent last year while solar power jobs rose by 25 percent, according to a Department of Energy study. Environmental groups hurled scorn on Trump's order, arguing it is dangerous and goes against the broader global trend toward cleaner energy technologies. "These actions are an assault on American values and they endanger the health, safety, and prosperity of every American," said billionaire environmental activist Tom Steyer, the head of activist group NextGen Climate. An overwhelming majority of scientists believe that human use of oil and coal for energy is a main driver of climate change, causing a damaging rise in sea levels, droughts, and more frequent violent storms. But Trump and several members of his administration have doubts about climate change, and Trump promised during his campaign to pull the United States out of the Paris climate accord, arguing it would hurt U.S. business. Since being elected Trump has been mum on the Paris deal and the executive order does not address it. Christiana Figueres, former executive secretary of the United Nations Framework Convention on Climate Change who helped broker the Paris accord, lamented Trump's order. "Trying to make fossil fuels remain competitive in the face of a booming clean renewable power sector, with the clean air and plentiful jobs it continues to generate, is going against the flow of economics," she said. The order will direct the EPA to start a formal "review" process to undo the Clean Power Plan, which was introduced by Obama in 2014 but was never implemented in part because of legal challenges brought by Republican-controlled states. The Clean Power Plan required states to collectively cut carbon emissions from power plants by 32 percent below 2005 levels by 2030. Some 85 percent of U.S. states are on track to meet the targets despite the fact the rule has not been implemented, according to Bill Becker, director of the National Association of Clean Air Agencies, a group of state and local air pollution control agencies. Trump's order also lifts the Interior Department's Bureau of Land Management's temporary ban on coal leasing on federal property put in place by Obama in 2016 as part of a review to study the program's impact on climate change and ensure royalty revenues were fair to taxpayers.